I’ve recently had friends tell me that they’ve been a little disenchanted with middle grade. I have to admit, I don’t read a ton of middle grade. I stick mostly to YA and sometimes read an adult book or a tween novel here and there. Which is why I picked up Michelle Mulder‘s OUT OF THE BOX — it has that perfect tween-ness to it, with thirteen-year-old Ellie right on that line that straddles the innocence of childhood and the angst of growing up. I love that kind of story. And OUT OF THE BOX blew me away.Ellie is super close to her family — her mom and dad always taught her that families talk about everything, so she always knows what’s going on in her parents’ heads. Sometimes that’s not such a good thing. Ellie struggles to be supportive of her mom when she’s feeling depressed, or when her dad hides out in his office for a super long time. She’s excited, though, to be spending the summer with her eccentric Aunt Jeanette in Victoria, helping to clean out her basement. While Ellie’s mom is sad to see her go, Ellie can’t wait to spend time with Jeanette sorting through all the junk and looking for gems to sell in a yardsale to benefit the local homeless shelter.It’s not long before Ellie finds a gem of her own — an Argentine instrument similar to the accordion called a bandneon. Ellie secretly loves tango music, even though her dad loathes the accordion he was made to play as a kid. When Aunt Jeanette tells Ellie she can have it, she’s beyond excited. She doesn’t tell anyone about it, though, but her new friend Sarah, the pretty girl next door who has surprised Ellie with her sweet and welcoming nature. Of course, everything isn’t peaches and cream with Ellie. Sure, she’s having a fun time with Sarah and going on regular adventures with her aunt, but things at home aren’t exactly spectacular, and Ellie’s mom calls every day to tell her how much she is missed. Plus, Ellie has found a secret sewn into the lining of the bandoneon case — both Canadian and Argentine money, and identification that Ellie traces back to people who went missing in the 70′s. 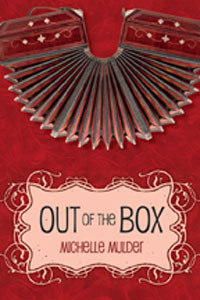 In fact, she’s about to find out a lot about Argentine history that puts her on the hunt for the original owner of the bandoneon, even though it means she might have to give it back.OUT OF THE BOX has so many elements — the nature of family and friends, loss, politics, mystery, music, and even mental illness — but everything is tightly knit together, creating a story that is both compelling and beautifully written. I felt like I knew Ellie by the time I finished this book. I was rooting for her every time she got a tough call from her mother, I cheered her on while she researched Argentine history, and I held my breath when she was having a tough time with her friends. For everyone who feels like there’s something missing in contemporary middle grade, I’m telling you, you’ve got to hunt this title down. You won’t be sorry. The fighting has just got to stop, thinks Ellie. She stays tucked in her room as much as possible to stay out of her parents' way. She jumps at the opportunity to spend the summer in Victoria, B.C. with her Aunt Jeanette, who is mourning the recent death of her partner. While helping Jeanette clean out her basement, Ellie finds a bandoneon, an instrument used by Argentine musicians. Along with the instrument are letters, airline tickets from the 1970s, and a large quantity of American and Argentine money. She sets out to learn about the events which took place in Argentina under military dictatorship in the late 1970s and early 1980s. Additionally, Ellie is dealing with the startling news from her aunt that her mother is most likely struggling with a mental illness. More research leads her to the son of the original owner of the Bandoneon. A wonderful story about a teen dealing with difficult family issues and learning about a little-known period of world history, at least by today's teens. Ellie wants to please everyone. She wants her parents to be happy, she wants to help her aunt Jeanette with her grief over losing her partner, and she wants to be liked by her cool new friend Sarah. But, what Ellie realizes over the course of this book, is that she can’t please everyone all the time, and she has to think of what she wants, as well as what others want. Finding the Argentinean instrument, the bandoneón is the first glimpse she has into finding her own joy. As Ellie realizes her mother may be mentally ill, and her home may not be the best place for her, will she choose to make others happy, or herself?This book hops along at a nice pace. The characters are briefly sketched, but fully realized, and the plot is mostly believable. The interpersonal relationships are accurate and dynamic, and I think the information that Ellie is given about what she can and cannot do to help her mother could be useful to kids who may be struggling with a parent who is depressed. Girl finds Argentine accordion, learns about life. I thought this story was a bit too "preachy keen" -- hanging serious messages and weighty historical information from the flimsy scaffold of a lackluster plot. Only my personal sympathy with the main character's family issues kept me going until the end of this. Recommended for the precocious kids who want to know more about troubling parts of the past, but are too sheltered to read anything more challenging. This might be a four star- I had a hard time deciding. This story is told simply. It is of a girl coming to understand herself and her family. By the end she believes her mother to have an undiagnosed mental illness. It's a quick and believable. The most authentic portrayal of parental mental illness I've read. Michelle Mulder - Michelle Mulder is a Canadian children's author. She loves writing about kids who seize life's opportunities, and she tries to do the same in her own life. Some of her favourite adventures have included helping to dig a water pipeline in the Dominican Republic, backpacking through Argentina with her husband, and riding a hot air balloon through a Cappadocian valley in Turkey. She lives with her husband in Victoria, BC.